Having an unwanted search engine like Radio.mysearches.co on the homepage is a clear indication of imminent further virus infection. This hijacker adware is known to be causing malicious redirects that may land the browser to malicious websites, which hosts malware or virus waiting to contaminate visitor’s computer. Radio.mysearches.co is also a bearer for a number of potentially unwanted programs (PUP) that are also members of its clan like Template.mysearches.co, Search.hmyclassifiedslist.net, and some others. Makers of this PUP continue to spread the host program called Free Online Radio App via series of doubtful websites masquerading as server of worthy applications like free games, media player, download helper, utilities, and software updates. Therefore, incautious web users who are enthusiastic of downloadable cost-less applications are in the front line of being infected with Free Online Radio App. Since Free Online Radio App is a cross-browser program, it may contaminate popular internet applications including Google Chrome, Internet Explorer, Mozilla Firefox, and Safari. Once installed, the adware will carry out unwanted changes on the browser right away. Homepage and new tab are most affected and new settings will force the pages to utilized Radio.mysearches.co for online searching. Apart from invasive actions, Radio.mysearches.co also steals browsing information from internet applications. Monitoring and logging search keywords, favorite websites, geographical location, and other vital data that are useful to provide personalized advertisements is also one of the primary concerns. So, expect to see overflowing advertisements during the presence of Radio.mysearches.co on the browser. Only solution to restore online safety and security is to remove Free Online Radio App extension. Complete steps to eliminate this threat from popular browser applications are provided in details on next section. Most adware and unwanted programs are using a program called browser extension to be able to take over the settings of internet applications. Therefore, we highly recommend to check and remove the extension that is closely related to Radio.mysearches.co. 3. Find Free Online Radio App, Radio.mysearches.co, or relevant entry and remove it from Google Chrome. 4. Look for object that is pertaining to Free Online Radio App, Radio.mysearches.co and remove it from the browser. 3. Look for and Remove or Disable entries of Radio.mysearches.co from Toolbars and Extension and Search Providers section. If Radio.mysearches.co is still present on the IE browser, another option is to remove the adware from Windows Control Panel. 7. Select Free Online Radio App, Radio.mysearches.co, or recently installed unwanted entry. Then, click on Uninstall to remove it from Windows system. In addition to the procedure, we suggest scanning the computer with AdwCleaner tool. Possibly, there are some traces of Radio.mysearches.co on the browser that was not deleted during the preceding steps. This tool will scan the computer and check for presence of malicious applications. 2. When the download has completed, please close all running programs on the computer especially browsers affected by Radio.mysearches.co. 4. AdwCleaner searches the computer for malicious programs, extensions, plug-ins, adware, and any items that may be associated to Radio.mysearches.co. Lastly, we will scan the computer with a multi-function security program. This will inspect the computer for possible presence of virus, malware, rootkit, adware as well as unwanted homepage like Radio.mysearches.co. 5. Internet connection is required when running this scanner in order to download important updates. Make sure that everything is up-to-date to effectively remove malicious program like Radio.mysearches.co. 6. Click the button to carry out the Scan. This will check the system for presence of malicious objects, malware, and viruses. The tool reveals items that were found linked to Radio.mysearches.co and other suspicious entities. Be sure to remove all identified threats. Combo Cleaner is a trusted Mac utility application with complete antivirus and optimization features. It is useful in dealing with adware, malware, and PUP's. 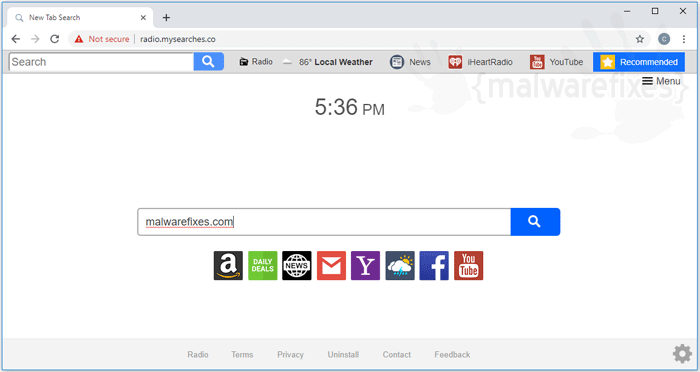 Moreover, it can get rid of malicious browser hijacker like Radio.mysearches.co. You may need to purchase full version if you require to maximize its premium features. 5. Wait until antivirus downloads it's latest virus definition updates and click on "Start Combo Scan" to start removing Radio.mysearches.co. 2. Once you have located Radio.mysearches.co or Free Online Radio App, click on Remove or Uninstall, to get rid of it. If you cannot find the specified file, please look for any unfamiliar or suspicious entries. It may be the one causing Radio.mysearches.co to be present on your Mac. Arranging all items to see the most latest ones may also help you identify recently installed unfamiliar files. Please press Option + Command + 4 on your keyboard to arrange the application list in chronological order. 4. You may now delete or remove locked files that belongs to Radio.mysearches.co homepage hijacker. 2. Run Malwarebytes Anti-malware for Mac. It will check for updates and download if most recent version is available. This is necessary in finding recent malware threats including Radio.mysearches.co. 5. After the scan, Malwarebytes Anti-malware for Mac will display a list of identified threats, Radio.mysearches.co is surely part of it. Be sure to select all items in the list. Then, click Remove button to clean the computer. - Lastly, remove Radio.mysearches.co from the Homepage field. Replace it with your preferred URL to be set as your default homepage. - Enter the desired web address as your home page, replacing Radio.mysearches.co. Click Save. - Under Home Page field, type the desired URL to replace Radio.mysearches.co settings. Some browser hijacker may also install login item into compromised account under System Preferences. This object automatically runs Radio.mysearches.co during user log in. 4. Next, select user account that runs Radio.mysearches.co. 6. Select Radio.mysearches.co, Free Online Radio App, or any suspicious entries from the list and click on the minus [-] button and confirm your actions. Please see image below for reference. 3. Select Free Online Radio App, Radio.mysearches.co or any relevant profile from the left pane. See image below. 5. Close the Profiles window and open the affected browser to change all settings associated with Radio.mysearches.co.